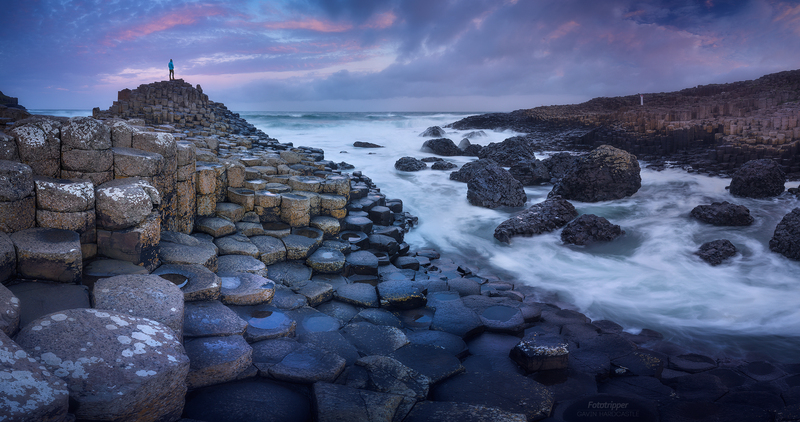 It was a mistake to even consider shooting a sunset at the ‘Giants Causeway’ in mid October. The crowds were thronging and not a single shot was to be had. I didn’t have much hope that sunrise would be much better, so imagine my joy when I discovered I was the only living soul on the beach the next morning. I had the entire causeway to myself so it was the perfect opportunity to dial in a panoramic selfie. This was made by taking 5 vertical shots using the Zeiss Batis 18mm prime lens on the Sony A7RII. I had a bugger of a time stitching these frames together in Photoshop but after much arm wrestling with the panoramic stitching settings I finally settled on using the ‘Reposition’ mode and I was able to get the stitch to look seamless. Any pano shooter knows that you need to shoot with a focal length of 50mm and above to get a seamless stitch but sometimes that’s just not possible. I also really like the distortion provided by super wide angle lenses so I use them anyway and hope that it will all come together during editing. Sometimes it doesn’t work but in this case it did. To capture the frame that had me standing on the rocks, I put the camera into ‘Timelapse’ mode so that it shot continuous frames while I climbed up on that basalt perch. All I had to do was stand there long enough to ensure that at least a couple of frames captured me in the shot and then I dashed back to the camera to manually shoot the rest of the pano. You have to move pretty fast when doing this as the clouds and waves will be in different positions for each shot of the pano. Using a longer shutter speed allowed me to blur the waves so that ghosting wouldn’t be too much of an issue during stitching. The result is a very high resolution panorama that could fill a wall and still look very sharp.